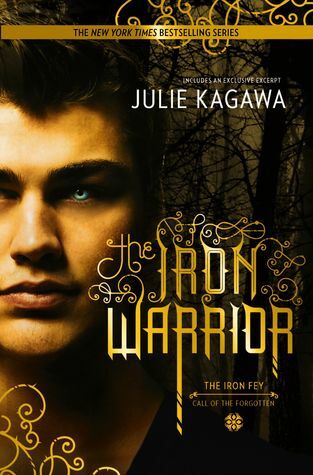 The Iron Warrior by Julie Kagawa is the final book in The Iron Fey: Call of the Forgotten. The Iron Prince- my nephew- betrayed us all. Waking after a month on the brink of death, Ethan Chase is stunned to learn that the Veil that conceals the fey from human sight was temporarily torn away. Although humankind's glimpse of the world of Faery lasted just a brief moment, the human world has been cast into chaos, and the emotion and glamour produced by fear and wonder has renewed the tremendous power of the Forgotten Queen. Now, she is at the forefront of an uprising against the courts of Summer and Winter- a reckoning that will have cataclysmic effects on the Nevernever. Leading the Lady's Forgotten Army is Keirran himslef: Ethan's nephew, and the traitor son of the Iron Queen, Meghan Chase. To stop Keirran, Ethan must disobey his sister once again as he and his girlfriend, Kenzie, search for answer long forgotten. In the face of unprecedented evil and unfathomable power, Ethan's enemies must become his allies, and the world of the fey will be changed forevermore. 1. It was a little bittersweet finishing this book, and coming to the end of Kagawa's Iron Fey series. This book does answer how Ethan survived Keirran's literal backstabbing at the end of The Iron Traitor. It also explains well what made Keirran lose his mind. And finally it reveals who the Forgotten Queen really is what her motives are. 2. Real talk, my favorite character of this series is probably Kenzie. She is smart, resourceful, and prepared for anything. She keeps Ethan from making mistakes with the Fey in dealings, and she does not let her own health issues stop her from living her life. 3. Ethan and Kenzie definitely have interesting traveling companions along their adventure this time with the Thin Man, Grimelkin, and Wolf. The race to save Nevernever and Keirran from himself it an exciting one, and was hard to put down. While Kagawa solved all the questions and issues presented in this series, I cannot help but feel that she left open the potential for more stories with Ethan, Kenzie and possibly Keirran.